The Grand Staircase-Escalante National Monument was created in 1996. It has since proven to be a treasure trove of scientific and historic resources, recreational opportunities, and spectacular scenery. in particular, the monument has become one of the world’s hot spots for new dinosaur discoveries. The casual visitor can experience a wide variety of park resources. This guide lists an extensive selection of activities. More information may be found at the official Grand Staircase-Escalante National Monument website. The image, below, is of an outstanding wall mural (40′ x 7′) at the Big Water, Utah, visitor center. It depicts the alien world of the monument during the Cretaceous Era (95 to 75 million years ago) and 45 creatures known to have been living there during that time. A graded dirt and gravel road which runs from US-89 in the south to Utah-12 on the north end of the monument in 46 miles. It is a popular backcountry route because it is a good north-south shortcut, offers numerous attractions, and can be navigated by most vehicles most of the time. From US-89, the road crosses the Paria River, then generally follows Cottonwood Creek beneath the Cockscomb, a land upthrust eroded into a series of ragged ridges, some very colorful. The popular Cottonwood Creek Narrows are 25 miles north of US-89 (not marked but watch for parking areas along road). Entry is west of the road, and there is about a mile or more of interesting hiking. Five miles north is the turnoff to Grosvenor Arch. The spectacular double arch, named for the founder of the National Geographic Society, is a popular photographic opportunity. The route then veers west to reach Kodachrome Basin and then Utah-12 at the town of Cannonville. Passenger cars can use this road but a high clearance vehicle would be easier. Road should not be used at all during wet weather. Our experience: From US-89, the first section of the road was rather wash-boarded, then generally easier in Cottonwood Canyon. The section west of Grosvenor Arch crossed several steep ridges with tedious driving. No problem driving the route in a 2WD truck. Much colorful scenery. Note: the turnoff from US-89, about four miles east of the Paria River is not easy to see. Watch carefully for the sign. Visit time: at least two hours to drive through. If you stop at the Narrows and Grosvenor Arch, it will take much of the day. Cottonwood Narrows – Popular and easy day hike through a narrow canyon. You can park at lower trailhead (24.3, 21.7), hike upstream to the upper trailhead (25.3, 20.7) and then walk down the road back to your car, a total hike of 2.5 miles. For a shorter and easier hike, start and end at the lower trailhead. The locale features the remains of a 19th century town and the site of a historic movie set in a scenic and very colorful canyon. The set, and general area, has hosted many TV and movie westerns over the years (Clint Eastwood’s The Outlaw Josey Wales, was the last one in 1975.). The town of Pahreah (means “muddy water”) prospered in agriculture until flooding washed away the fields. Access is by dirt road. The remnants of the movie set were removed a few years ago, rebuilt due to popular demand, and finally burned to the ground several years ago. However, the Pahreah town site ruins, the 19th century graveyard, and spectacular scenery remain. Road is impassable when wet. Our experience: The dirt road is easy for all vehicles to the site of the movie set. The roads crossing the Paria river to the town site are much rougher, and a high clearance vehicle or 4WD is strongly advised. Not much remains, but it does give the visitor some feel for what remote 19th century life must have been like. Visit time: a couple of hours. Johnson Canyon Road leaves US-89 about 8 miles east of Kanab, and runs north through Johnson Canyon for about 15 paved miles. It merges into Skutumpah Road which is graded dirt and veers east crossing scenic Skutumpah Terrace. The road becomes rougher in the last 20 miles as it crosses canyons and streams before reaching Cottonwood Canyon Road just south of Cannonville on Utah-12. Total drive is about 46 miles. Two notable stops are the Bull Valley Gorge (right) and the Willis Creek Narrows. Bull Valley is noted for a truck which went off the bridge in the 1950s and is still lodged between the walls high above the ground. This section may be impassable when wet. Our experience: Easy driving in Johnson Canyon and Skutumpah Terrace. The going got harder approaching Bull Valley, and a side trip up Willis Creek was very difficult. We used a 2WD truck. Hiked along Bull Valley Gorge north of the road and got a view of the wreck (too shadowy to photograph). The gorge may be entered by hiking a short distance to the north. Visit time: a few hours to drive the road, most of the day to explore the canyons. Bull Valley Gorge – Exciting section of narrows similar to Buckskin Gulch. Potentially difficult obstacles. View of 1950s pickup truck embedded in the narrows. Ten miles south of Cannonville. Willis Creek – Easy canyon hike with several stretches of narrows. Nine miles south of Cannonville. Lick Wash – Pleasant half-day hike in narrow canyon lined with Ponderosa pines and Douglas fir. Gravel canyon bottom makes for easy walking. About 20 miles south of Cannonvillle. The Smoky Mountain Road is the most remote and challenging of the main dirt roads through Grand Staircase-Escalante National Monument. It runs 78 miles from Big Water on US-89 to Utah-12 just west of Escalante. The route requires a high clearance vehicle, four wheel drive to explore the side roads. It is more difficult to navigate due to unmarked intersections. The reward is access to very beautiful places in a very lightly visited area. The road is noted for the Kelly Grade which offers a huge panorama, and you pass an unusual area of balanced boulders. There are access roads to rarely visited vista points on the north side of Lake Powell. Several movies were filmed in the area, including “Planet of the Apes”. Smoke and occasional burned areas can sometimes be seen from a century-old underground coal fire (hence the name, Smoky Mountain). Visit time: expect to spend a couple days in the area. Don’t try the road unless you are very self-sufficient. Always carry plenty of water in your vehicle. Avoid the area during wet weather. Smoky Mountain Road in Lake Powell area – Glen Canyon National Recreation Area. Geologic Road Guide to GSENM – PDF. Good mile by mile descriptions will aid navigation. Smoky Mountain Road starts on page 58. This 55 mile dirt road leaves Utah-12 east of Escalante and ends at the historic Hole-in-the-Rock (10a), high above Lake Powell. The road generally follows the route of the 1879 pioneer expedition which carved the trail at Hole-in-the-Rock, allowing a wagon train and over 1,000 head of cattle to descend the 2,000 foot cliff to the Colorado River, now Lake Powell. The lake partially covers the trail but present-day visitors can still hike down to the lake and back. The road also features Devil’s Garden (10b, right), an Outstanding Natural Area with easy hiking (12 miles south of Utah-12); Dance Hall Rock, a sandstone amphitheater where the pioneers recreated (mile 36.4); and access to the most popular hiking trails in the Canyons of the Escalante River (see Item 12), including Hurricane Gulch and Coyote Wash. Note that the last six miles of the road requires high clearance and preferably 4WD, and the road is impassable when wet. In recent years, the monument has become a world hotspot for new dinosaur discoveries. Major discoveries have been made on the Kaiparowits Plateau which runs roughly from the town of Escalante south to Lake Powell. Casual visitors may sample this at the Twentymile Wash Dinosaur Megatrackway (10c). Discovered in 1998, the trackway features over 800 dinosaur footprints. The turnoff is 13.6 miles south of Utah-12, and requires 2.4 miles’ drive on a rough side road. Check for current conditions at the Escalante Visitor Center. Our experience: Very easy driving to the Hurricane Wash parking lot, not a problem for passenger cars during dry weather. Everything is fairly well-signed. Visit time: most of the day to drive the road and back, while making a few stops, though it would be rather tedious. Expect to take several days if you plan to go hiking. For the most part, it’s not really a day hike area. 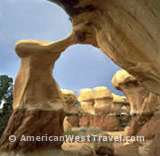 If you don’t have much time, visit Devil’s Garden, or perhaps the short slot canyons in the Dry Fork of Coyote Gulch.